Go to original pattern for design DROPS 179-4. 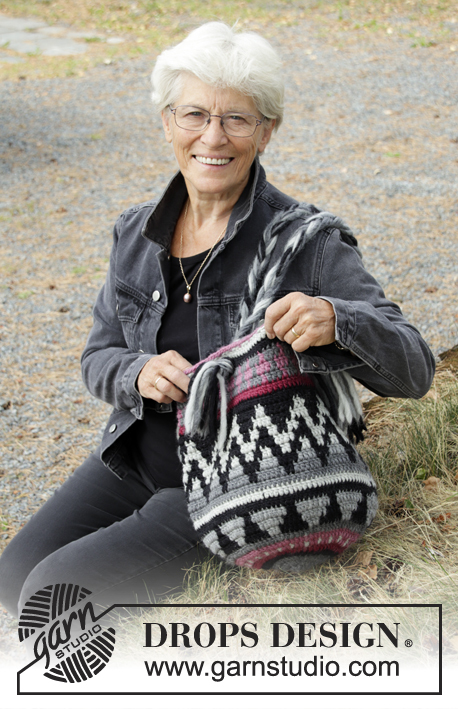 Crochet bag with coloured pattern. The piece is worked in DROPS Eskimo. The bag in the picture weighs 423 g.
When changing colour, work as follows: Work the last treble crochet before the colour change, but wait with the last pull through. Change to the next colour and make the last pull through before working with this new colour. 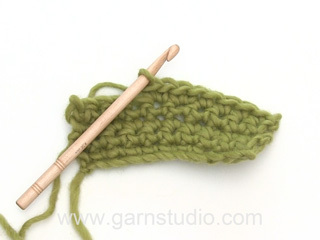 If next round starts with a new colour work the last slip stitch on the round with the new colour. 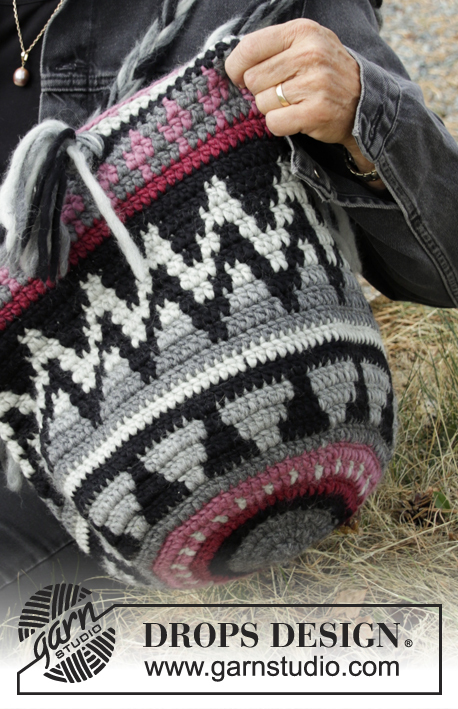 When working with more than one colour on a round, lay the strands you are not working with over the stitches from the previous round, work around these strands so that they are hidden and carried around the piece. 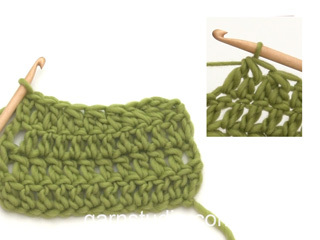 Decrease 1 treble crochet by working the next 2 treble crochets together as follows: Work 1 treble crochet, but wait with the last pull through (= 2 loops on hook), work the next treble crochet, but when working the last pull through, pull the strand through all 3 loops on the hook. 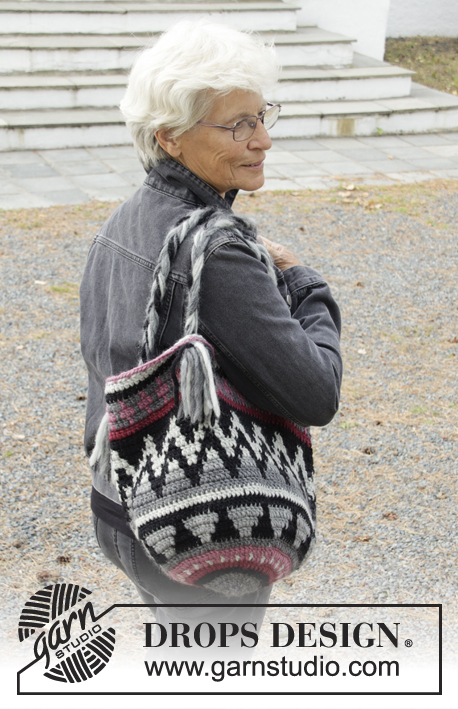 The bag is worked in the round, from bottom up. Work 5 chain stitches with dark grey with hook size 4.5 mm. 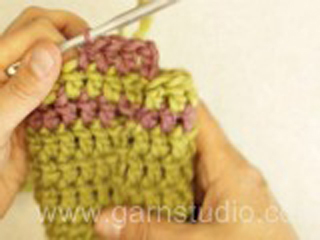 Form them to a ring with 1 slip stitch in the first chain stitch. 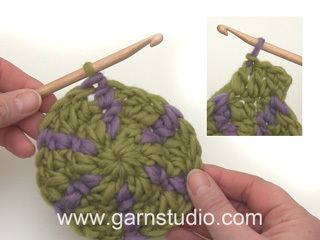 Continue working in the round according to diagram A.1 (work 11 repeats of A.1 in width) – READ COLOUR PATTERN! ROUND 1: Work 11 treble crochets around the ring – READ CROCHET INFO! ROUNDS 5-11: Continue with increases and pattern as before, i.e. each round work 1 more treble crochet between the increases = 110 treble crochets on the round. ROUND 12: Work the last round in A.1, AT THE SAME TIME increase 2 treble crochets evenly on round (increase by working 2 treble crochets in 1 treble crochet) = 112 treble crochets. ROUND 13: Continue working in the round, but now without increasing and according to A.2 (= 7 repeats in the round). NOTE! 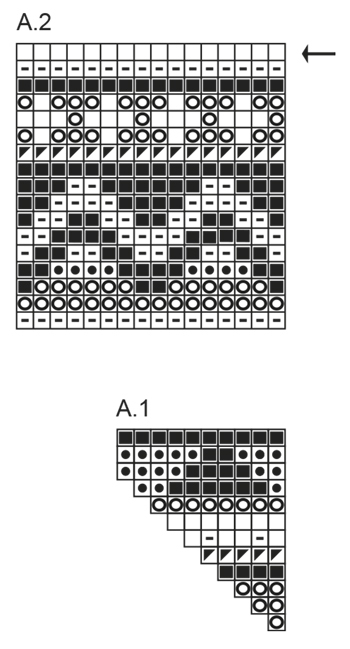 On the last round of A.2 (marked with arrow in diagram) do not work treble crochets, work as follows with old pink: 1 chain stitch (replaces 1 double crochet), * 3 chain stitches, skip 2 treble crochets and work 1 double crochet in the next treble crochet*, repeat from *-* to end of round and finish with 1 slip stitch in the first chain stitch at the beginning of the round. Cut and fasten the strand. Cut 6 strands black, 5 strands light grey, 5 strands medium grey and 5 strands dark grey = 21 strands of 120 cm. Lay the strands together and tie a loose knot, leaving approx. 12 cm of yarn before the knot. Divide the strands into 3 bunches with 7 strands in each bunch. Plait the 3 bunches together until there is 25 cm left in length. Divide the strands in 2 parts. Thread the 2 parts through the bag (from inside out) on the third round from the top, allow 1 treble crochet between the parts. Tie the parts together in a knot on the outside of the bag. Pick up the knot from the beginning of the plait and fasten the end in the same way, but in the opposite side. Make another plait in the same way and fasten on the other side of the bag. Kedves Hajni, abban a sorban, ahol csak egy szín van nem feltétlenül szükséges a nem használt szín(eke)t vezetni. ezekben a sorokban elég egy színnel horgolni. Kérdéseire közvetlen választ is kaphat a Facebookon a Magyar Drops csoportban. Sikeres Kézimunkázást! Kedves Hajni! Köszönjük a kérdést. Mindig csak azt a két színt kell körbe vinni, amit az adott sorban használunk. Mivel minden sorban mindig csak két szín fut, így, ha az éppen nem használt színt horgoljuk körbe, a horgolás vastagsága egyenletes marad. Sikeres kézimunkázást! 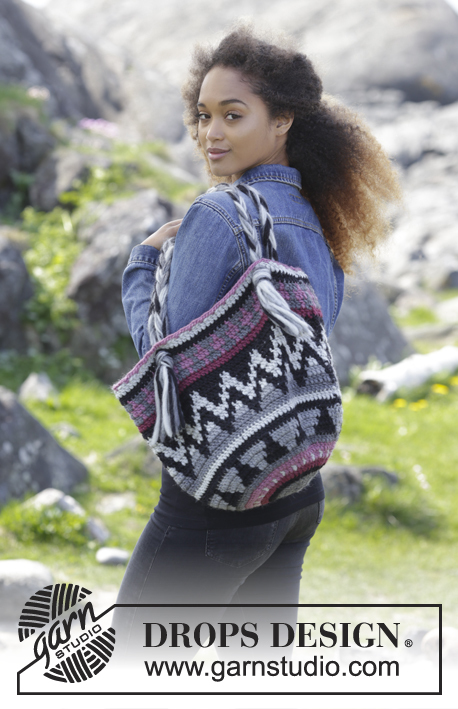 Made the other similar bag and I love the patterned crochet, it is so much fun to make!